Infinix Hot 3 Review, Specs and Price in Nigeria: Infinix Hot 3 a successor to the Infinix Hot 2, is the latest smartphone device released by the Original Content Manunfacturer (OEM), Infinix mobility. Early this year, this high end device was announced on social networks by Infinix Mobility and has been said to be another android device that has been built for lovers of selfies. 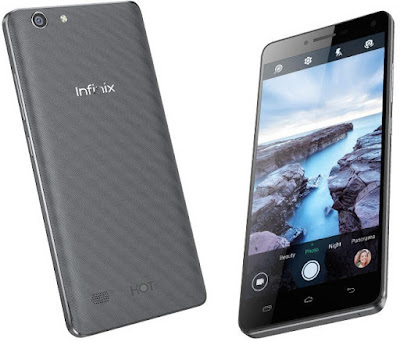 By just looking at the infinix HOT 3, one might say that there is no difference between this device and HOT 2, but on comparing the specs and features of Hot 3 with that of its its predecessor, one will note that the Hot 3 comes with better features. Some of these include the latest android OS(6.0 marshmallow), larger RAM, display, and battery capacity, and a better camera. This device has been designed to provide good viewing angles, an amazing image capturing capability, deliver smooth performance and still retain the well known budget friendly nature of Infinix devices. Comparing the specs of the Hot 3 with its predecessor, not much has changed especially in the camera specs of the Hot 3. But there are still some significant changes in the Hot 3 and some of which include a larger display screen, larger battery capacity and slightly better camera specs. Instead of a 5-inch screen as found in the Infinix Hot 2, the Infinix hot 3 has a display screen of 5.5 inch with a resolution of 720 X 1280 pixels. At this resolution, images displayed on the Hot 3 may be slightly less sharper compared to images displayed on the Hot 2. The Hot 3 has a pixel density of 267ppi. This pixel density and resolution ensures that the device produces pictures with detailed and vivid quality. Giving this phablet its sleek design is a body that is made from plastic and made available in five colour variants (Gray, Gold, Silver, Pink, Blue) and also a curvy rear panel that has a diamond texture making the device easy to hold and carry around. The Infinix Hot 3 is powered by a 1.3GHz quad-core MediaTek MT6580 processor, it runs on Android 5.1 Lollipop OS, has a 1 GB/2 GB variants of RAM and an Internal Memory of 16GB that can be expanded up to 32GB via microSD card. This device's 1GB and 2GB RAM models are offered at different prices and are available to complement individual usage requirements. The processor, OS coated with an optimized XUI skin and the RAM all enable the Infinix Hot 3 to provide fast performance and deliver long standby time. The Hot 3 features an 8MP back camera which is capable of capturing 1080p videos at 30 frames per second (fps) or 720p at 60 fps. Its front camera of 2MP utilizes 16:9 light chip and 1.6 µm large pixel for high definition picture quality. The 84°wide-angle lens with soft flash on the front camera provides an ambient environment that allows pictures to be illuminated when shooting in low light conditions. Camera features on this device include focus tracking, timed photos, touch capture, voice recognition, timed photos, smile and gesture recognition. The Hot 3 has a battery whose capacity is 3000mAh, an improvement over the 2,400mAh battery capacity of the Hot 2. This battery has been Optimized with low consumption design and is said to provide 9 hours of web browsing(ya right!! ), 20 hours of talk time, and 33 hours of music. In Nigeria, the Infinix Hot 3 can be preordered from reputable online stores in the country. The price of Infinix Hot 3 in Nigeria is expected to range from ₦26,600 to ₦37,000 depending on your location and whether you go for the 1GB or 2GB RAM variant. The camera and battery capacity of the Infinix Hot 3 have been improved as well as its design which in turn gives it its premium look and feel. At the price the Hot 3 is being offered and the specs it features, i'll say the Infinix Hot 3 has been carefully crafted with great engineering and is a good device for an average smartphone user. Would I buy this device? Well, after using the Infinix hot that has lived up to its name for being "HOT", i don't think i can buy the Hot 3. If the Hot was HOT and the hot 2 was HOTTER then i suppose the hot 3 will be the HOTTEST. Make sure you install an air condition on this device if you buy one. lol. Na, it's a good device, you just go ahead and buy it. Also buy a pouch to go with it, you'll thank me later.